Likud still in the lead with the current elections poll, but hareidi parties moving up the ranks as center bloc suffers. Yisrael Beytenu continues to weaken, according to the latest elections poll, and Shas is making a comeback even as its chairperson Aryeh Deri has yet to officially return following damaging recordings that were recently exposed. A TNS poll for Walla! and Maariv published Friday shows Likud still in the top spot, at 25 seats, up from the last poll published Wednesday at 22. 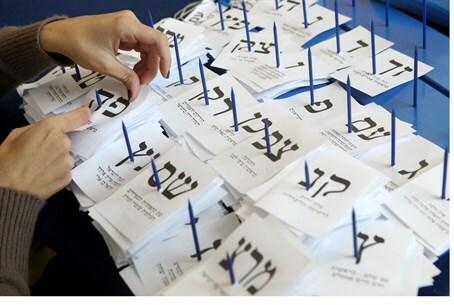 Labor-Hatnua would become the second-largest party in the Knesset, with 24 seats; Jewish Home remains in third place with 15 seats. The Arab parties combined would gain 11 seats - broken down into United Arab List (UAL) at six, Hadash at three, and Balad at two. It is still unclear whether or not they will be running on a joint list, although if they do not only UAL would pass the needed four mandates to make it over the threshold. The center bloc and hareidi parties have begun to even out somewhat, with Moshe Kahlon's Kulanu at ten seats, Yair Lapid's Yesh Atid at nine, and United Torah Judaism (UTJ) at eight seats. Foreign Minister Avigdor Liberman's Yisrael Beytenu party has fallen behind at six seats, tying with Shas and Meretz for the bottom of the polls. Eli Yishai's Yachad - Ha'am Itanu party does not make the threshold according to the poll. Otzma Yehudit continues not to be represented in the polls, with the party revealing it is the target of an intentional media blackout after a senior pollster told them they are being excluded from the survey lists. Friday's poll is dramatically different from Wednesday's poll for Haaretz, which showed Labor in the lead with 24 seats, Likud with 22, and losses for Kulanu. Meanwhile, 50% of Israelis polled would prefer Prime Minister Binyamin Netanyahu as prime minister, vs. just 25% for Labor leader Yitzhak Herzog. A full 25% has still not decided yet or does not prefer either candidate. Likewise, 37% of respondents believe Netanyahu is also best suited to solve Israel's housing crisis, compared to just 24% for Lapid and 14% for Kahlon. 25% are undecided or believe none of them will.